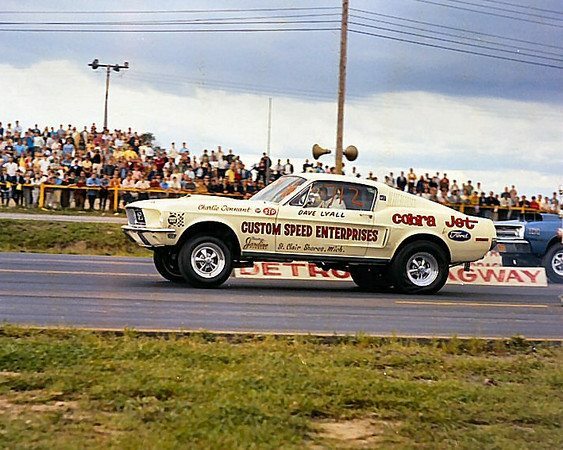 The Cobra Jet history began when Ford Racing returned to NHRA Sportsman Racing with historic Mustang Cobra Jet Win! In 1968, Ford took the NHRA Winternationals by storm with the Cobra Jet Mustang. Only 50 units were built and released to Ford dealers and Ford racers, in its’ first appearance, the Cobra Jet won. To commemorate the 40th anniversary of the original Cobra Jet, the 2008 model hit the drag strip – and like its predecessor, it won first time out! Owned by Hajek Motorsports and driven by John Calvert, the Cobra Jet stormed to victory at the 2009 NHRA Winternationals – a fitting tribute to its heritage. Buoyed by its stunning performance and the demand for another NHRA – legal sportsman race-car, Ford Racing is proud to announce the new 2010 Mustang Cobra Jet. Like the highly successful 2008 model, this new entry from Ford Racing is a factory-built race car (serialized, but not street legal), ready for the drag strip with only minor additional prep required from the racer. 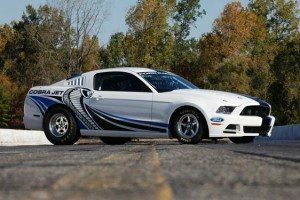 Intentionally limited production makes this Cobra Jet both the fastest drag racing production Mustang ever and also a highly sought-after collectible. The 2010 Mustang Cobra Jet (base number M-FR500-CJ10) is offered by Ford Performance in five different engine/transmission combinations and joins Ford Racing’s two successful road racing Mustangs, the FR500C, and FR500S, as turn-key race cars available to racers of all levels. We encourage you to take advantage of this unique opportunity to help rewrite history by ordering and campaigning this new race car. Finally, while built to NHRA specs, this package will not be restricted to NHRA competition. In 2013, Ford Racing’s Cobra Jet program turned 45 – and while the U.S. Nationals may have been the perfect place to debut the Factory Stock Showdown class, it merely transformed into another chance for the Cobra Jets to grab the spotlight. 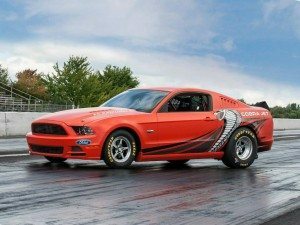 Cobra Jet Program turns 45 – The NHRA Factory Stock Showdown made its debut on Thursday (2013) at the U.S. Nationals in Indianapolis with the hopes of showcasing the Ford Mustang Cobra Jet, Dodge Mopar Challenger Drag Pak, and the Chevrolet COPO Camaro. Like its ADRL SuperCar Showdown counterpart, the Factory Stock Showdown turned into a showcase for the Mustang Cobra Jets at Lucas Oil Raceway, predominately making up most of the field and putting together most of the top performances. It’s an impressive nod to the powerful Cobra Jets, and also an indication of how far ahead they still seem to be of the new Drag Pak’s and COPO Camaros at this point. 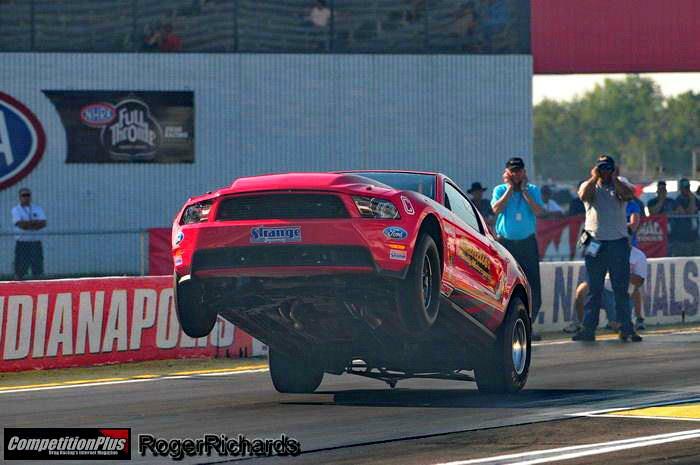 “I think (the NHRA and ADRL) are both having the same problems, trying to get the comparison between each car, getting the Camaros and Drag Pak’s equal with the Mustangs. Again, it turned into an all-Cobra Jet show,” said driver Chris Holbrook, who has won an ADRL SuperCar Showdown event in his Cobra Jet in 2012. Holbrook was ousted in one semifinal by Bo Butner, who met up against Brett Candies in the first finals for the new class. Butner has owned the ADRL version, racking up five wins and put together a series of strong runs in Indy. BORN AGAIN – Roy Hill remembers being at the NHRA U.S. Nationals the first time Pro Stock ran in the prestigious event. That was, 1970 and now more than 50 years later, Hill is still enjoying every minute of the biggest drag race of the year. “It’s a dream come true to be coming out here 45-50 years,” Hill said. “To see the way the sport has grown is tremendous. It’s just unbelievable.” Hill’s outstanding Pro Stock days may also be behind him, but he’s at peace with that, thanks in part to the 2010 Mustang Cobra Jet that has reinvigorated Hill in recent years. Driving the Super Stock A car in 2011 was Charlie Downing and joining Hill in 2012 at the U.S. Nationals is NHRA Pro Mod and ADRL Pro Nitrous standout Robert Patrick Jr. Hill is sticking with the 2010 Cobra Jet while Patrick has a 2012 version that checks in at 3,400 pounds, or five pounds lighter than Hill’s. 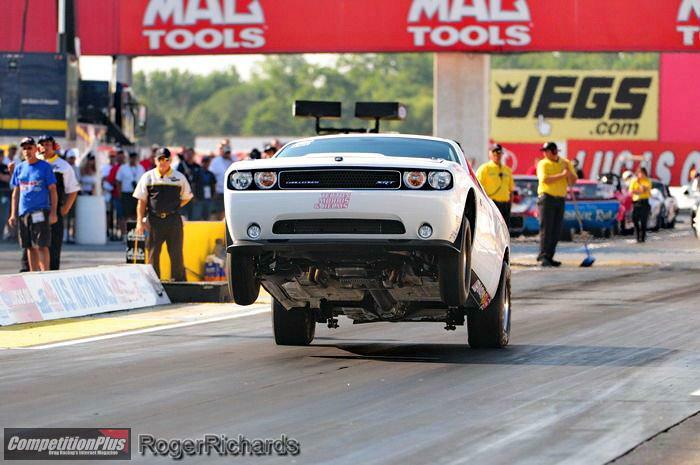 After four rounds of qualifying at Lucas Oil Raceway, Hill had gone 8.368, while Patrick was right behind at 8.437. This is the first year they’re competing in the SS/AAA class (9.40 index), and Hill gladly explained why it made its first appearance in 2012 in Super Stock at the U.S. Nationals. “NHRA made a special class I guess you could say, because between Roy Hill and Ray Skillman, we’ve hit the index so many times that they made a class for us to race in where it’s now hard to beat the index,” Hill said. A total of seven cars is in the SS/AAA class heading to eliminations, including Skillman’s grandson, Drew, who went a class-best 8.242 on Thursday. But Hill is aiming high in, 2012 and he’s not going to be content with just winning in SS/AAA. “I’ve won the class two years in a row, and that means a lot, but that’s not what Roy Hill wants to do. When I got back in this sport three years ago, I thought I could win again. I still think I can win, but my hat is off to all these sportsman racers,” Hill said. “It’s a glorified bracket, race and I’m learning every time I go out how to cut lights better and how to be more consistent. There are so many ways you can lose a race.” Of course, Hill has found plenty ways to win as well, making it practically a habit over the past 50-plus years, and he’s certainly a favorite to make it three straight wins in 2012. As for his previous area of expertise, Hill continues to marvel at what is being accomplished in Pro Stock in 2012. With his recent run of success in Super Stock, he also said he’s at peace not racing in the pro ranks these days. “You know, I really am. 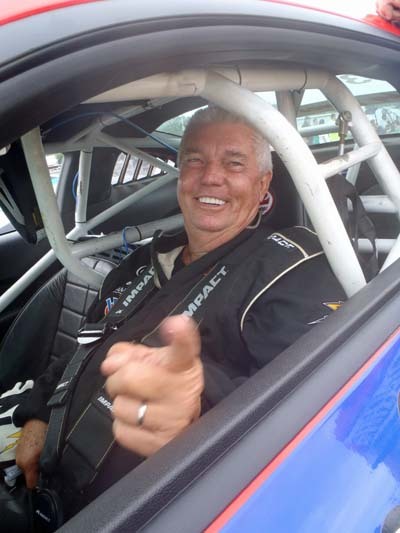 As far as my age and my health goes, I could not compete on a weekly basis with the Pro Stock cars with the way they are today and the amount of people it takes to run them,” Hill said. FIRST TO WIN FACTORY SUPERCAR SHOWDOWN – Bo Butner scored the inaugural NHRA Factory Supercar Showdown title by defeating Brett Candies in a battle of Cobra Jet Mustangs. Butner used a 9.10 to score the victory when Candies lost traction. “Tire-frying torque,” is how Jesse Kershaw, Ford Performance Racing drag racing competition manager, described the performance of the Cobra Jet Twin Turbo concept. Watson Racing team was thrilled to be involved in the inside prototype work. The contemporary Cobra Jet has evolved since that 2008 model, and for 2013 is offered with either a naturally aspirated or supercharged 5.0L V8. The Twin-Turbo Concept is also 5.0 powered but takes forced induction in a different direction. Unlike a belt-driven supercharger, which requires engine horsepower to operate, a turbocharger is driven by exhaust gas, so there is no parasitic power loss. So, how much power will this 5.0 put out? Jesse just smiled and offered the “tire frying” comment mentioned above. Power numbers are still a work in progress, apparently, though Ford Racing is anticipating this car to make high 8-second quarter-mile passes—a bar already set by no fewer than 10 Cobra Jet race teams. However, racers interested in the turbocharged Mustang can go to the Ford Performance Racing website, where they can be put on a waiting list should the Twin-Turbo Concept become reality. The car even has its own part number: M-FR500-CJ. **** Information from, Drew Hardin – a citizen journalist for Ford Social. For the last decade, Watson has been very proud to be an integral part of the Ford Performance Racing Program, including the Cobra Jet, Mustang S550, Boss 302S, and S197 builds. Since 2013, Watson Racing is an authorized Ford Performance Racing Parts Dealer. Also, Watson has released its’ own brand of authentic “Watson Racing” products. Previously, road race, drag race, and street application parts were only available on new Cobra Jet or Boss 302 Mustang racing cars. Check out Watson Racing web store today!